This year Sony Pictures released the new Carrie on Oct.18 in theatre, which received mostly mixed reviews from the public. If you have ever watched the first version Carrie (1976),I believe you also have something to say. But anyway, this film starring in Chloe Grace Moretz and Julianne Moore, has something for us and somewhat worth seeing. Let’s learn more information about it. Besides, at the end of this post, I’ll share you the fastest and most effective solution to rip DVD Carrie as the DVD is to be released on Jan 14,2014 .Meanwhile I have some Christmas gifts for you all. Carrie (2013) is the third film adaptation of Stephen King’s well-known novel of the same name. It becomes the 14th highest-grossing Stephen King movie of all time. It currently has a 49% approval rating on Rotten Tomatoes based on 151 critics. But Carrie was ranked at number 3 behind Gravity and Captain Phillips, both of which were in their second and third weeks, respectively. So I think to discuss whether this new version is better or not, you should have watched it first. You will find there are not many new things in this film compared with Brian De Palma's horror classic. A reimagining of the classic horror tale about Carrie White (Chloë Grace Moretz), a shy girl outcast by her peers and sheltered by her deeply religious mother (Julianne Moore), who unleashes telekinetic terror on her small town after being pushed too far at her senior prom. 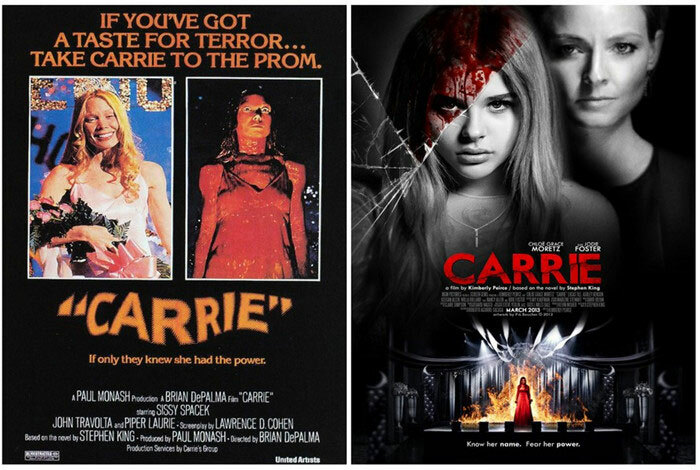 If you want to watch DVD Carrie on tablets or other handheld devices, you need to first rip DVD Carrie and then convert it to the formats compatible with your devices. Mostly of you are familiar with HandBrake. Yes, as an open source, HandBrake helps us a lot. But most of the new DVDs are now encrypted with technology, such as DVD CSS, region code, RCE, Sony ArccOS, UOPs, Disney X-project DRM and the latest technology. You should refer to a HandBrake alternative. And guess what, here I’ll tell you the best relatives to HandBrake to help you easily but perfectly copy DVD Carrie or any other DVDs like the best anime movie of the year – Frozen released by Disney, The Thor 2,The Hunger Games: Catching Fire, Gravity, Captain Phillips and more. Now download the best alternative to HandBrake and install it on your computer. The installation is safe and clean. Step 1: Open the DVD converter and press the “Load DVD” button. And then you are able to choose which part of the DVD is to be ripped and converted. Two options are offered: Main Movie and All Movies. Note: If you choose All Movies, every chapter of the DVD will be analyzed. You can also unselect some chapters if you don’t want them to be converted after analyzing. The conversion is more flexible. It’s all up to you! Step 2: Now select a proper output format. Or if you don’t quite get what format is compatible with your device, you can just select a device. The parameters including the encoder, bit rate, resolution, sample rate, etc are set well for the device by the program. Note: Almost all formats are supported and you can also convert normal videos to HD videos. The devices supported are various, including some latest portable devices like iPad Air, iPhone 5S, iPhone 5C, Nokia Lumia series, Samsung GALAXY series and any more. Step 3: After selecting output format, click “Run” to start to backup DVD Carrie and convert DVD Carrie to iPad or any other device. Note: The program supports Intel® Core TM, NVIDIA® CUDATM and AMD® to generate 6X faster video conversion speed with ZERO quality loss. Don’t afraid your movie night will be ruined by long time waiting. Download online videos from video-sharing websites, including YouTube, Vimeo, Liveleak, Metacafe, etc. Christmas Gifts for All of You! By the way, WonderFox soft is celebrating Christmas in advance, offering discounts up to 70% off the normal price during 2013 Christmas promotion. Check now to see if there is a proper Christmas GIFT for you or your family! Want to enjoy a happiest Christmas with your kids? Start a sweet holiday tradition with watching best Christmas movies for kids with family. This post also gives you a list of Christmas movies for children. Make a Copy of DVD Frozen to Watch on the Go! Frozen proves Disney's return to animation greatness, which is adapted freely from Hans Christian Anderson’s “The Snow Queen”. It’s also the 53rd animated feature in the Walt Disney Animated Classics series. Now make a DVD copy of this movie to enjoy with family and friends.